Beautiful Alizes enjoys a stunning view over the water of Simpson Bay lagoon and the Caribbean in the distance. 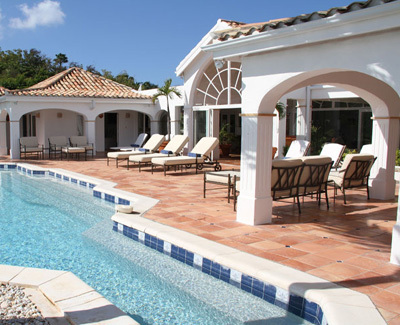 This 5 bedroom villa is located in Terres Basses within a community of only 6 villas featuring a private tennis court. Interior spaces include a spacious comfortable living room with lots of cushioned seating and a large TV with Dish Satellite and DVD. Plus there is smaller air conditioned office with computer, cozy seating and another TV. The entire back of the villa opens through glass and glass doors to the infinity- edge pool and the water view. There is formal dining for 8, a sunny breakfast table and bar for as many as 12 and 2 separate conversation areas for at least 4 each. The bedrooms each feature oversized King-sized beds, separate full baths in Caribbean colored tile, big walk-in closets and either water, pool or garden views. The 5th bedroom is one level down and is accessed by a wide concrete stairway. It features a private terrace with water view and a kitchenette. There is a large kitchen with a center island and lots of work space and opens to the side grilling porch. The villa is conveniently located in Terres Basses, just minutes to the islands best beaches, shopping, restaurants, nightlife and the charming French capital town Marigot. With 5 spacious and private bedrooms, the villa is perfect for friends traveling together as well as large families.